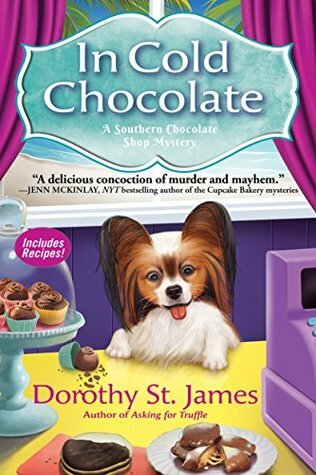 In Cold Chocolate, by Dorothy St. James, is the third book in the Southern Chocolate Mystery series. It takes place in Camellia Beach, South Carolina where Charity Penn owns The Chocolate Box. Her shop is filled with delectable chocolate treats that are hard to resist. In this book, “Penn” is joining her friend and other volunteers of the sea turtle watch team to help the baby turtles make their way to the sea. Shots ring out and the volunteers run to find the local “Casanova” dead and Jody holding the gun. It's up to Penn to find the killer to clear Jody's name. I really liked this book. The town is a small seaside community and The Chocolate Box is where everyone meets to have coffee, delicious chocolaty treats and catch up on the town's gossip. The characters are a fun group of young and older residents. They watch over Penn as she is settling into her new surroundings. They inject humor into the story that made me laugh out loud. The book has a mystery within the mystery. While trying to figure out the main mystery, I love to figure out how both stories fit together. This is the first book I've read in this series. It pulled me right into the story from the first page. It kept me engaged until the end. I wanted to keep reading to find out how it all came together. This book was so good, that I want to read the first two of the series to learn more about the other characters and what other adventures Penn has. I recommend this book to anyone who loves a mystery that pulls you in and won't you let go until the very end. I received an ARC copy of this book to review from NetGalley and Crooked Lane Publishing.